Let’s think “spring”, shall we? Today’s FREE crochet pattern is a beautiful blanket made with Red Heart Boutique Unforgettable, which is one of my favorite yarns to use because of the gorgeous colors! This is the Spring into Summer Blanket, designed by Susan Carlson, who owns the website, www.feltedbutton.com. 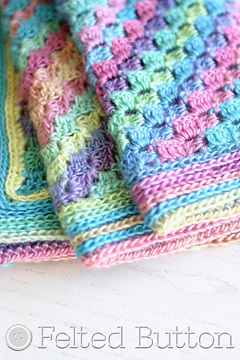 You can see more photos of this beautiful blanket on Susan’s website here. You can find this FREE crochet pattern in Susan’s Ravelry store here or in her Craftsy store here. I hope you enjoy this beautiful, FREE crochet pattern!